Laymyatnar pagoda stands 150 feet far away from the northern part of Htoakkanthein pagoda. The pagoda built by king Min Saw Mon in 1430 AD, is one of the first five pagodas in Mraukoo. 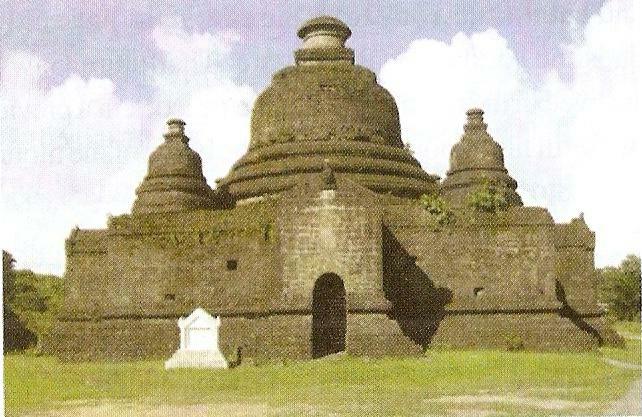 The pagoda is called Laymyatnar pagoda because the four entrances of the pagoda face the four directions. The pagoda was built in the form of arising of the great pagoda amidst the four surrounding pagodas. Dadugatba and the inverted golden bowl are above the bell-shaped dome. The pagoda is enclosed with the stone wall in four directions. There is the entrance at each of the eastern and the western stone walls. There are five Buddha images in the niches of the wall between the two entrances. There are eight stone Buddha images facing eight directions at the center of the cave tunnel. The total number of Buddha images are twenty eight depending on the verse of Thanboatday. The pagoda built by Na Ra Nu in AD 1433 who was a younger brother of king Min Saw Mon, is in the northern part of Laymyatnar pagoda. That pagoda is called Naranu pagoda. The stone Buddha image which is 10 feet high, is in the cave. 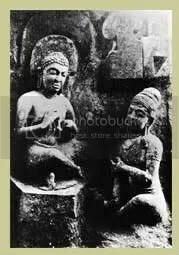 There are twenty eight Buddha images in the twenty eight niches in both sides of the cave of the Buddha image. Nowadays, the pagoda was reconstructed. The pagoda is 70 feet high and a simple architectural design without decoration.